The 40th anniversary of the Apollo moon landings is approaching, and many groups are having celebrations and commemorations. 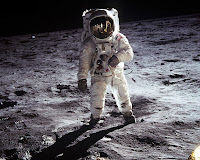 Apollo 11 landed on July 20, 1969, so this July 20th will mark the 40th anniversary of the first boots on the Moon. Looking forward, we are going back to the moon. The Lunar Reconnaissance Orbiter is already preparing our path back to the moon, with the end goal this time of a permanent Lunar settlement. A Lunar base camp would allow us to study the Moon and stars in greater detail than ever before, and may be used as a "rest stop" on the way to Mars. Below, you will find a list of links and resources on the 40th anniversary of the Apollo landings. If you've got any events that you would like added to the list, just leave a comment! In order to find answers first we must question everything. That is the tricky art of science, exploration and logical truth. Was this a military diversion or ruse? Are people that ask questions “just a conspiracy theorist” to be dismissed because they question authority? Is the Emperor Naked? The evidence for this moon landing to be a hoax is still plausible. In 1969 there was a lot of cloak and dagger with Russia “The Nuclear Space Race”. In WWII the world seen many hoax’s to confuse the enemy, is this just another Hoax? There are some very serious questions about the legitimacy of this event that have still not being answered. There is no argument against the manipulation of the pictures because even NASA staff had witnessed tampering of photographs and are on public record claiming so. There are suspicions over the deaths of the original pilots that had been asking questions about the plausibility of the moon project. Does the moon belong to China because it was presented as a gift to one of their Emperors? Did Poland really invade Germany in 1939? With no dental records or finger prints was that really Hillers corps? Judging by the way we treat this planet I am not so sure it is a good Idea that we go anywhere until we learn to respect the environments we live in or visit. The emperor is naked ? The emperor has fine clothes. Interesting... I watched a documentary on Sky yesterday about this and there are many people that have died in suspicious circumstances that were involved in the Apollo project. Some branches of the US authorities suspected NASA of fraud and the main operative in charge of investigating the NASA Apollo program was found dead (along with his wife and child) but his report mysteriously vanished into thin air. There is photographic evidence of this man holding the report in his hand shortly before he had “a little accident”. NASA has links with the NAZI Party such as Braun the V2 rocket scientist, makes you wonder how many other NAZI members worked in this area (and other areas of ‘our’ world governments) so would it be of any surprise if this was a murderous hoax for NASA to get public funding (tax) to secure its future? One of the many issues with the moon landing is how did Apollo 11 manage to survive one of the largest solar flares ever recorded ? If those space suites are so good then why do they not use them in radioactive areas such as Chernobyl or Three Mile Island ? I would love the concept of space travel but judging by how we abuse everything in reach we will never make it into space, or the end of this century. It is a miracle that we have made it this far. Is it because of money, fraud, greed and murder that make people that ask questions just a conspiracy theorist to be dismissed without credibility ? 7. Are politicians just gangsters looting the tax for self profit = ? All manned space programs are below the radiation belt and Russia knew it was not possible to reach the moon because of the radiation. They did not lose the space race as would be supposed by ‘our’ establishment. A physicist stated that the spacecraft would have needed to be made of lead 6 feet thick to shield the crew! It was made of aluminum as was their space suits. So if a nuclear device goes off then all we need is a roll of aluminum paper from the kitchen to be safe ? What is the point of a celebration in something that never happened 40 years ago other than to keep a deception alive? Fantastic publish! Thanks a lot. I'm truly getting excited about viewing the actual movie. We began talking away regarding dependency more than last year and also have in no way regretted this. Right now follow-up Cash Advance Here's my personal weblog is actually you're fascinated.